See MisterChill's selection of ice making pub equipment. At MisterChill, our primary focus is to provide brand-leading pub equipment to the licensed trade at discount prices. We won't charge you hefty amounts for the installation of our pub equipment, nor will we charge you for any hidden extras. If you do need assistance when connecting your pub equipment, full installation instructions for every product is available to download from this website. When you have chosen and ordered, we will deliver within 5 working days if you live in mainland UK. All of our pub equipment is brand new, and because it is all ex stock, it is less expensive than you'll find elsewhere. 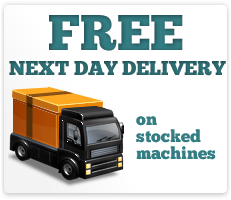 We deliver directly to your doorstep, you wont find a better deal in the UK. We won't sell you unnecessary extended warranties, either, because all the machines we offer are strong and robust - quite simply they don't need it. We don't believe you'll find a more simple and efficient service anywhere.